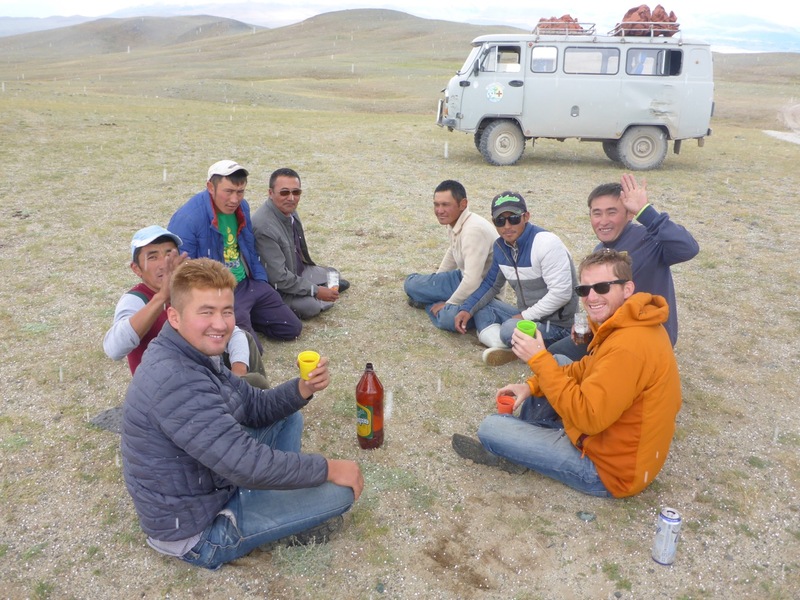 The next morning after saying by to the family; Liz, Erbolot and I headed out onto the Mongolian steppe on horses while our driver put a few chunks of “Bruce” in the van and drove to our next camp. Over the next 5 days we spent half the day riding and the other half enjoying the beautiful surroundings and some pretty amazing sunsets. Liz enjoyed every minute on horseback as we crossed fields and streams. 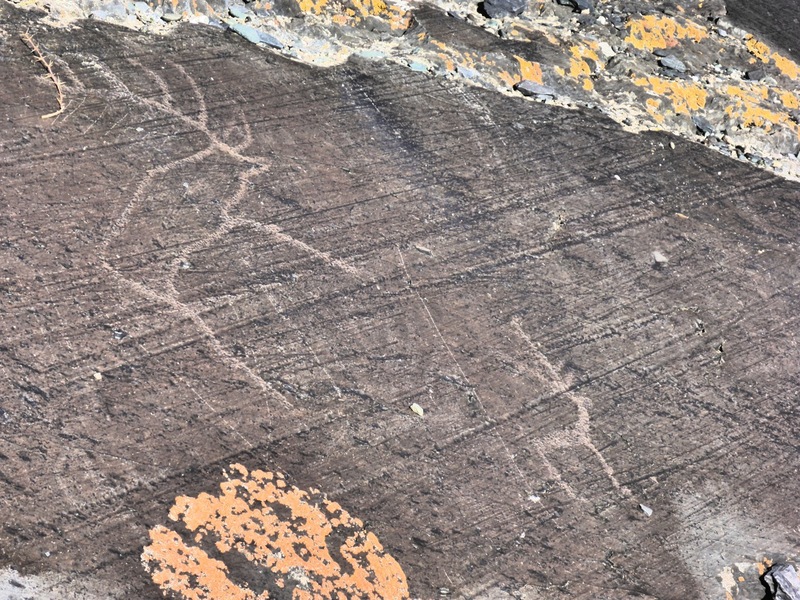 We explored petroglyphs high on a hillside. We tried to make friends with some 2 hump Bactrian Camels. But they weren’t having any of it. We camped out under the stars and enjoyed some wonderful fresh caught trout shared with us by some locals and ate plenty of Bruce. 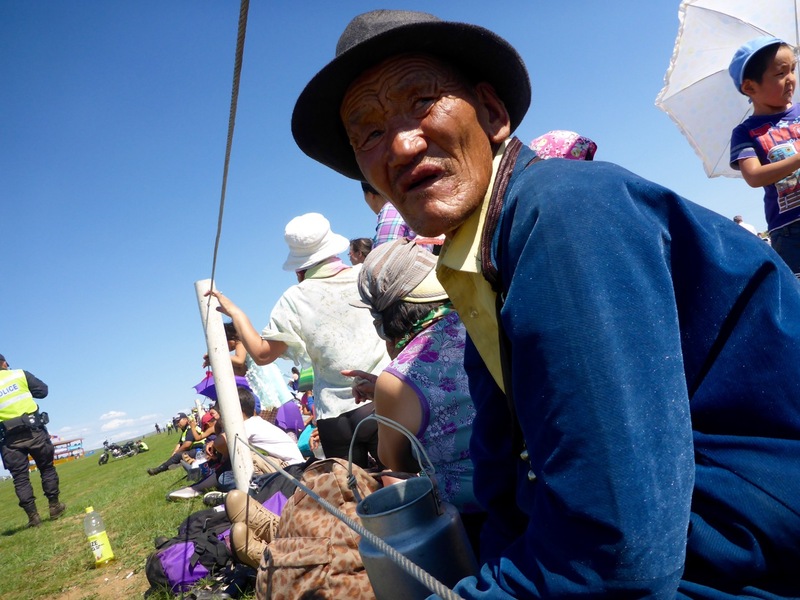 In true Mongolian fashion, we had beautify blue skies and some pretty ridiculous weather. 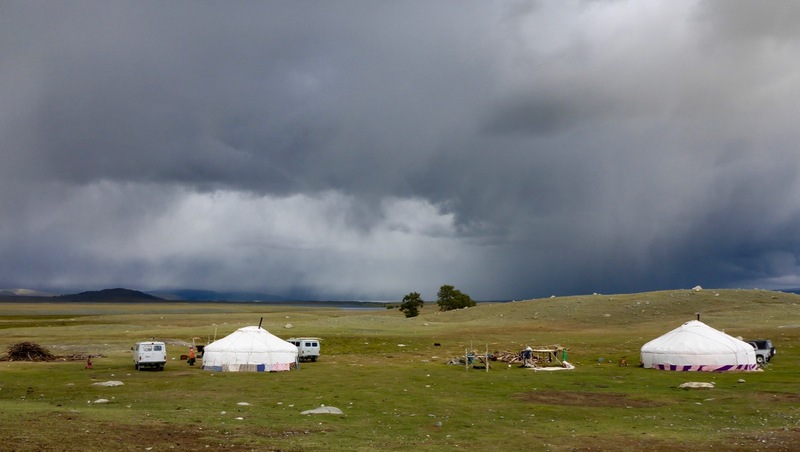 One afternoon we had our cook tent blow down in the wind and unfortunately our day hike to the highest point in Mongolia, Khuiten Uul Base Camp, was a bit anticlimactic in the rain. 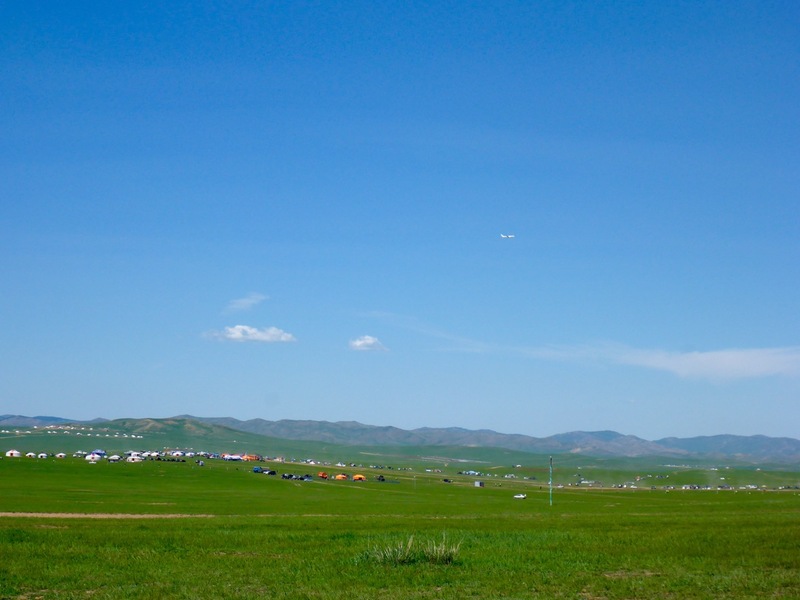 View of the highest point in Mongolia. We also enjoyed one last bottle of wine given to us by our good friends Gavin and Becky to celebrate the conclusion of our trip. They sent us off on our journey with an amazing bottle of wine that we enjoyed in Nepal; So it was extremely special to enjoy another outstanding vintage from such a remote vantage. And before we knew it our time was up and we were rattling through fields back to Ölgii. Upon arrive back in Ölgii our first order of business was to get a plane ticket back to the capital. 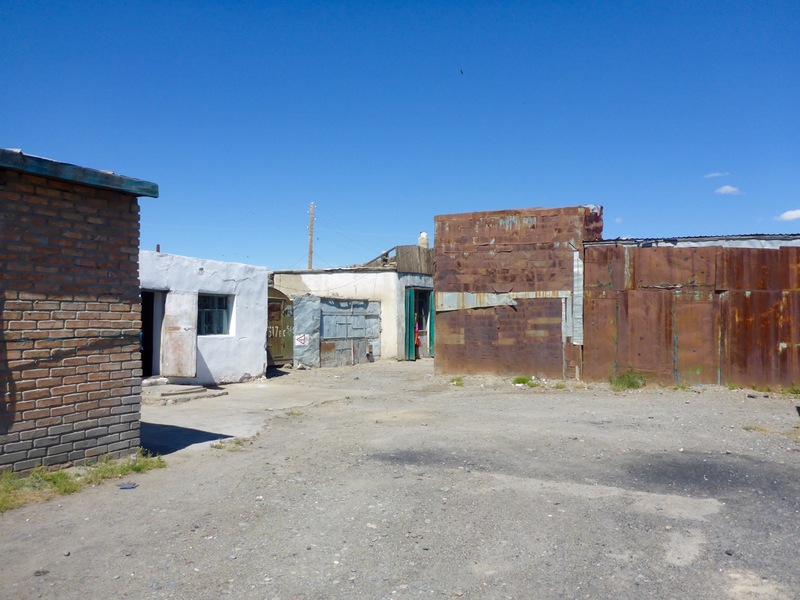 We had heard plenty of horror stories of the bus ride from Ölgii to Ulaanbaatar and we were willing to do just about anything to avoid that… anything except spend 2 more weeks in the thriving metropolis of Ölgii, Mongolia. Apparently August is back to school time, which means every kid in the country is making their way to school … in Ulaanbaatar. Those with means fly and those without take the bus. 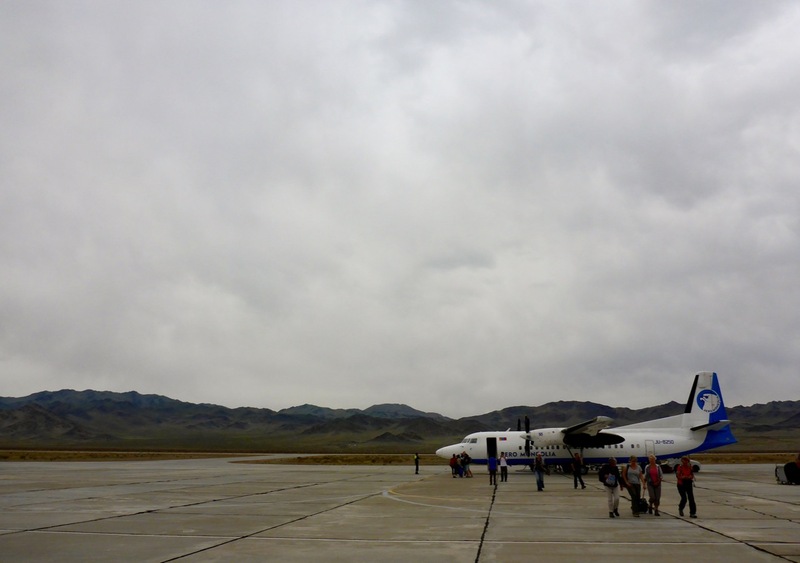 And with only one airline in the country and only one flight every other day from Ölgii to Ulaanbaatar we were looking at at least 2 weeks before we could get a seat. Any seat! So, looks like we’re taking the bus. We asked around about how long it should take to get to UB on the bus, “Two to Five Days.” DAYS. DAYS! They are measuring the time in DAYS! Clearly it was their marketing that sold us. WHERE DID OUR BUS GO? WHAT HAPPENED TO MONGOLIAN TIME? Three more trips from the Toyota guy later and it’s now a quarter to 4 and we’ve got our 11 passengers. As we start getting in the van we’re told we need to sit in the back. Oh, no. We know this routine. We’re sitting right here in this middle row, we got here first. After a little back and forth they realize this isn’t our first rodeo and give in. 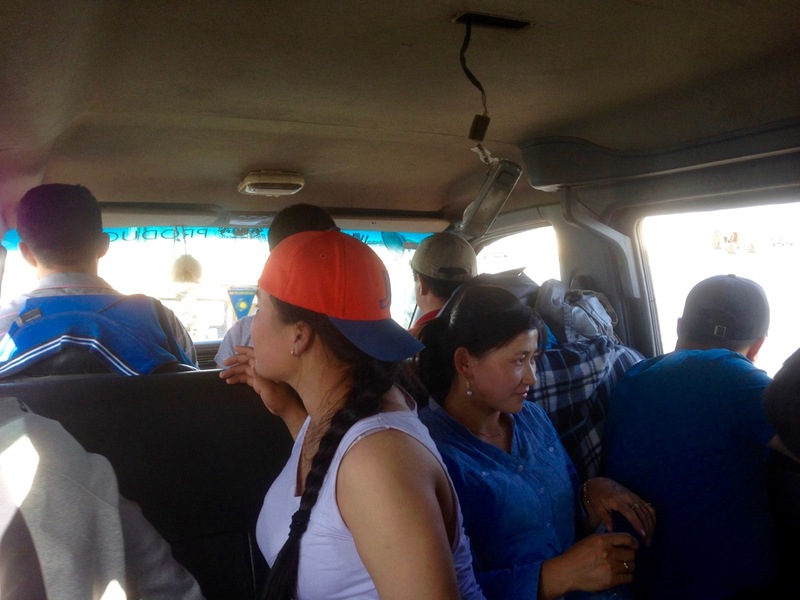 By the time we leave town we’ve made 2 more stops and we are comfortably sitting 5 wide on a 3-person seat with 17 people in an 11-passenger van looking at over 1000 miles of open fields between us and Ulaanbaatar. Desperados waiting for a mini bus. Just trying to make friends during a breakdown. Being towed across a river by a tractor. And through the nightly karaoke party that seemed to break out at dusk every night. I guess we’re lucky it didn’t take the full 5 days! 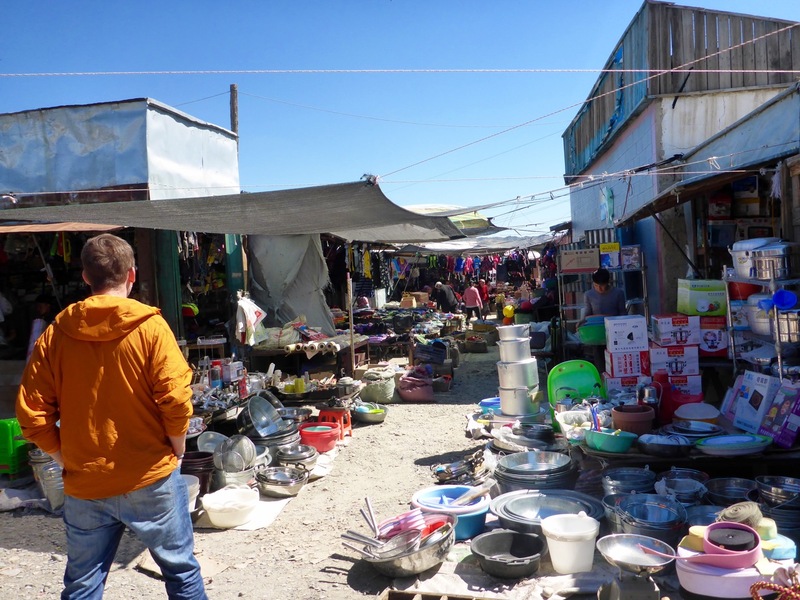 The Black Market in Ulaanbataar is a leftover from the Soviet era in Mongolia, when it was Communist and all shopping and markets were controlled by the government. The Black Market was an illegal market where individuals went to sell their goods. Now it’s huge, and legal, but the name hasn’t changed. And you can literally find ANYTHING you could possibly want there. We went specifically to buy riding boots for me. 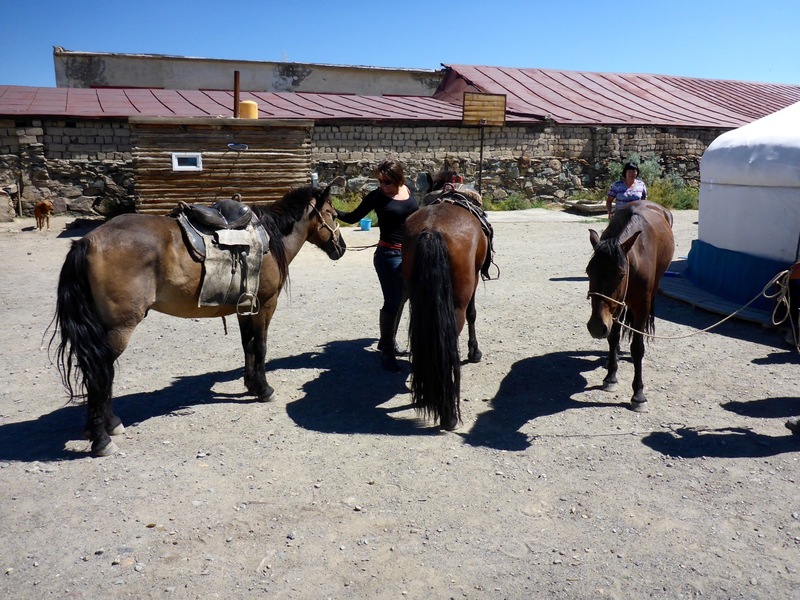 We also wanted to check out their tack selection, but planned to buy our saddles in Olgii, the city we would fly into to begin our horse adventure. 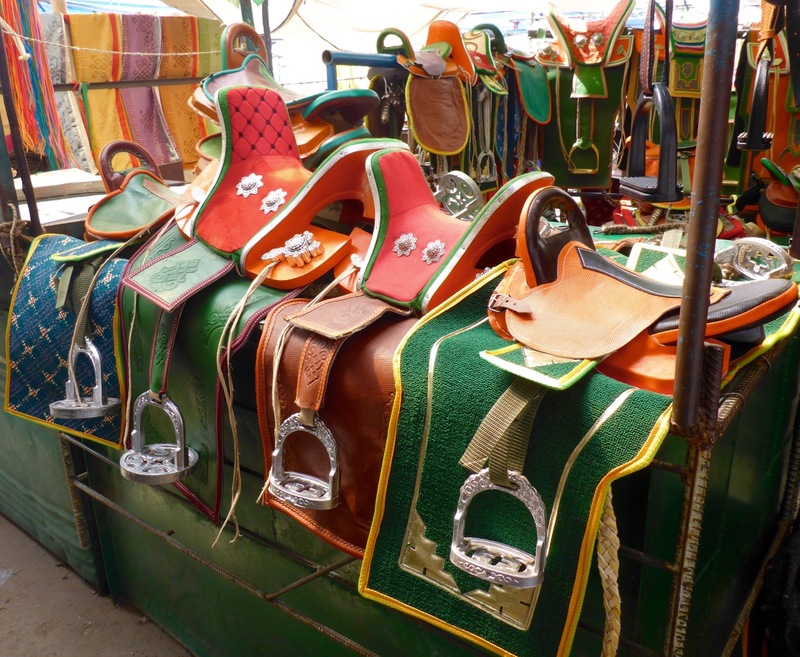 It was overwhelming, but we finally made our way to the tack section and were blow away by how beautiful the saddles were! … and how strange they were. I guess I understand now why we saw all of the riders standing up when they did anything faster than a walk. 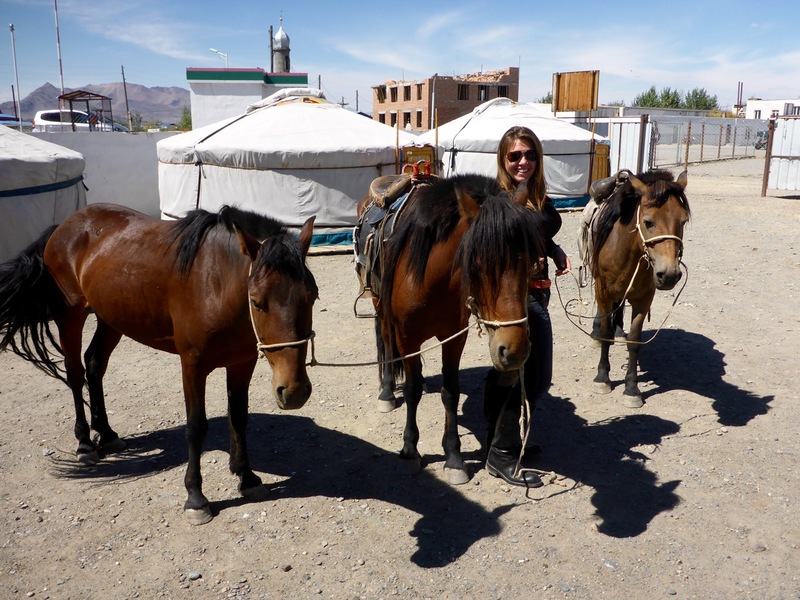 I also quickly realized that I would NOT be riding for multiple weeks in a Mongolian saddle. Not gonna happen. Hope they have other options in Olgii. 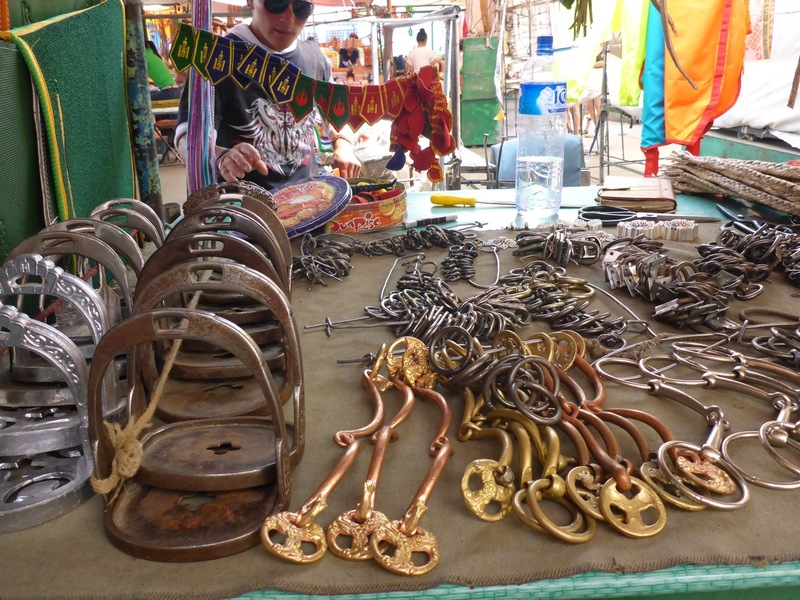 We learned that most likely there would be Kazak saddles in Olgii, since the population there in Western Mongolia is all Kazakh. Then we found our way to the boot section of the market. There were dozens of vendors and thousands of boots! 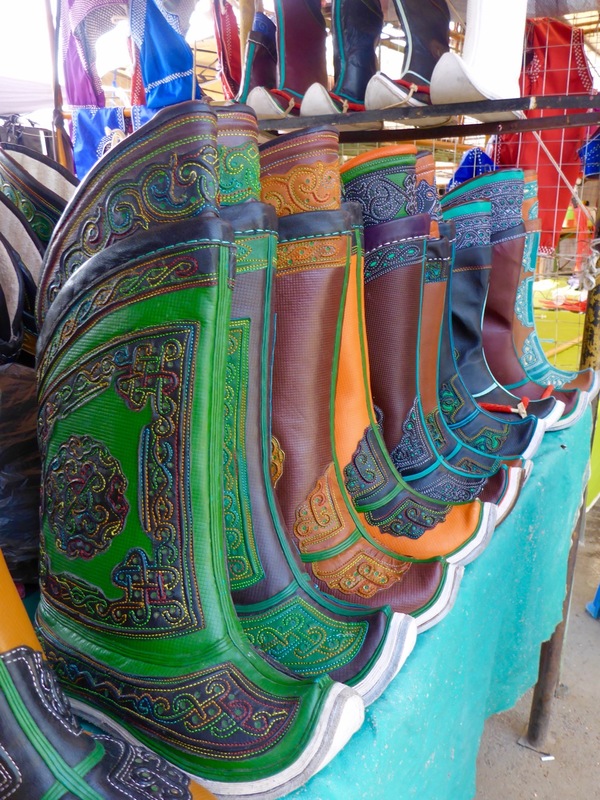 I immediately fell in love with the traditional Mongolian boots – they are so unique! But they wouldn’t be my riding boots. 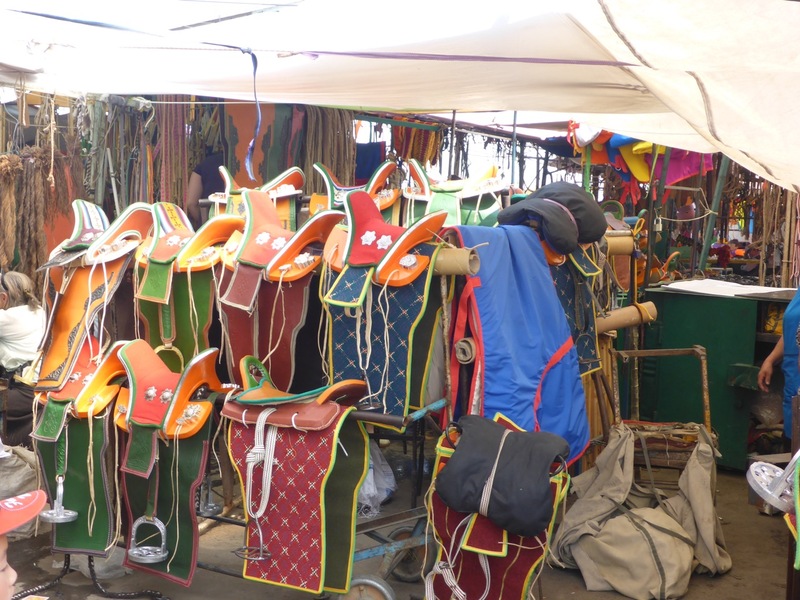 Fortunately, the prices were lower than we expected, so Rick agreed to let me get two pairs, one for riding and one for wearing back home. Before we left, we found an amazing section of antiques and traditional items. We haven’t been able to buy really any souvenirs on this trip because we couldn’t carry them. 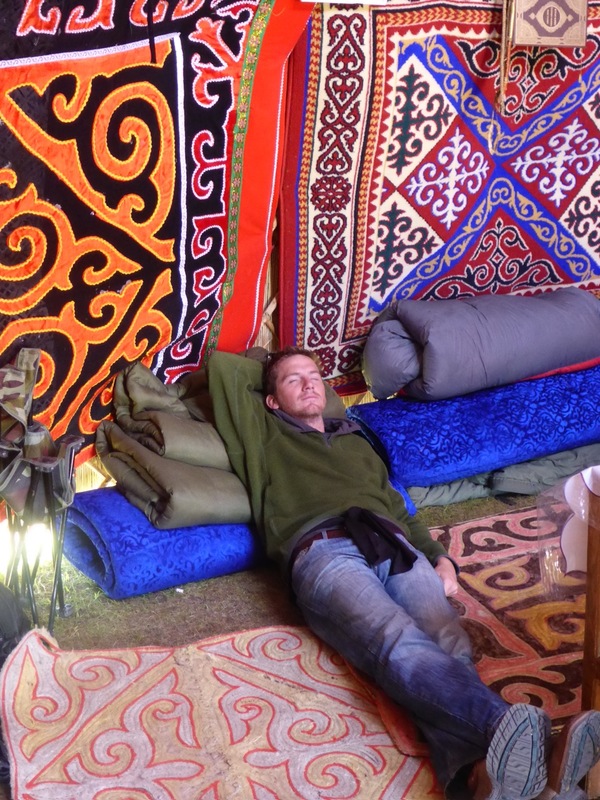 But since Mongolia was our last stop (besides a few days in Korea), we let ourselves stock up. It was also some of the coolest items we’ve seen, in that they were all authentic (not stuff made for tourists to buy) and really interesting. We ended up with a variety of items from a royal family’s turquoise jewelry to a beautiful heirloom snuff bottle, a singing bowl to traditional bronze bells. 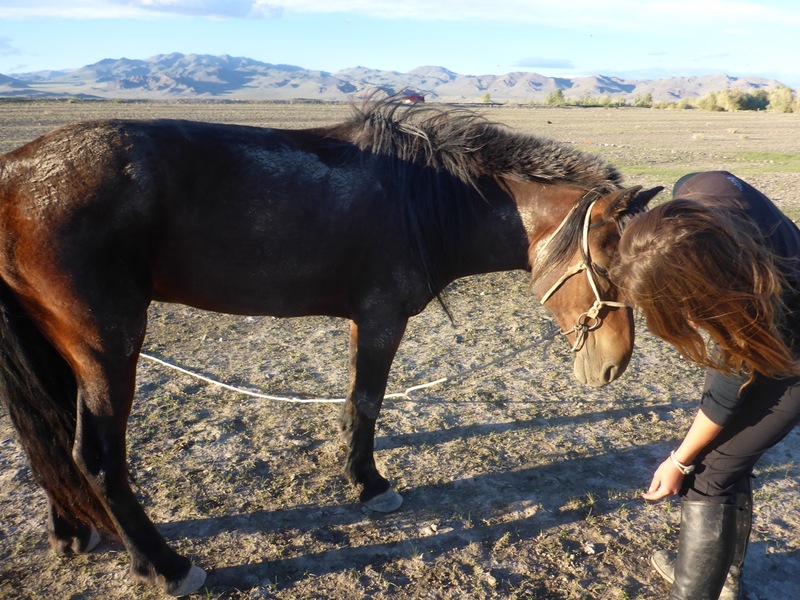 And of course, my beautiful Mongolian boots! 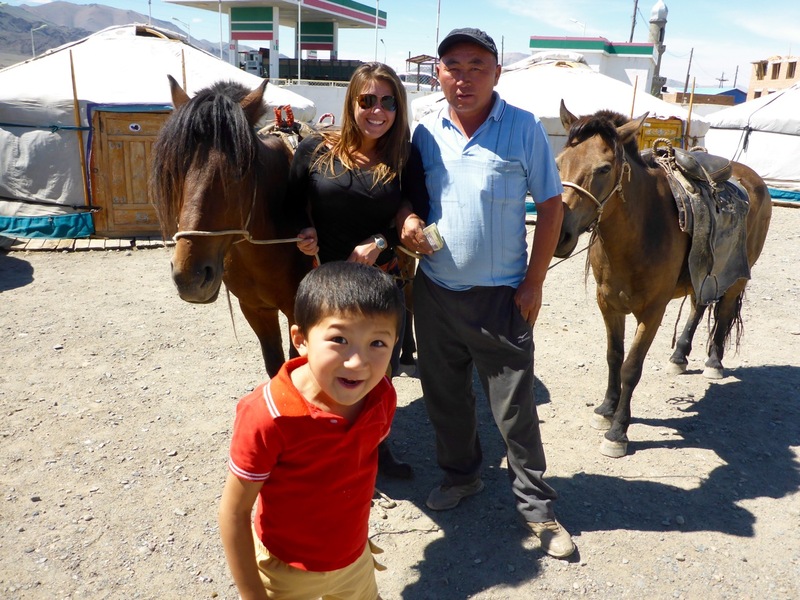 Getting to mingle with Mongolians going about their day-to-day business and seeing the incredible goods was a highlight of Ulaanbataar for us. 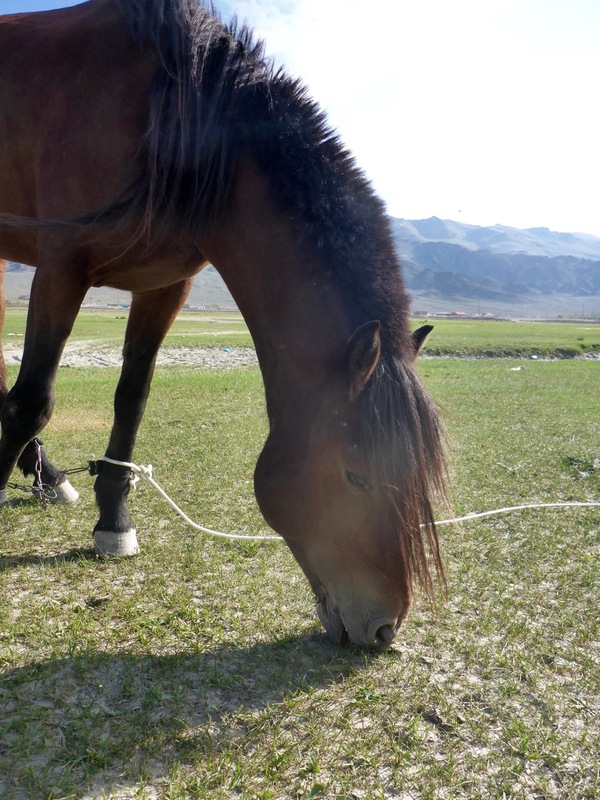 Since before we were even planning our big trip, we had this crazy idea that we wanted to go to Mongolia, the land of blue skies, horses and nomads, buy horses and ride across the steppe. 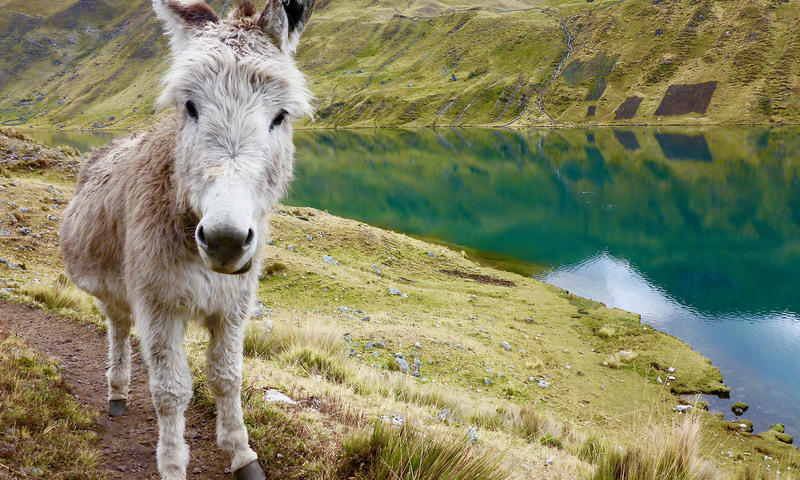 So while in South America, we got an itch to end our trip with something big and adventurous – and Mongolia sounded like just the thing. So thanks to an amazing friend who helped us out with discounted flight tickets, were able to go. We arrived in the capitol, Ulanbataar, from Beijing in the middle of the night and had fortunately booked a hostel already. We groggily woke up the next morning with plans to figure out what the heck we were doing (which part of the huge country we wanted to go horsetrekking in, how to get there, how to buy horses and tack) – but immediately got sidetracked by a flyer hanging in the hostel that offered a ride to the last Nadaam Festival of the year – Today! 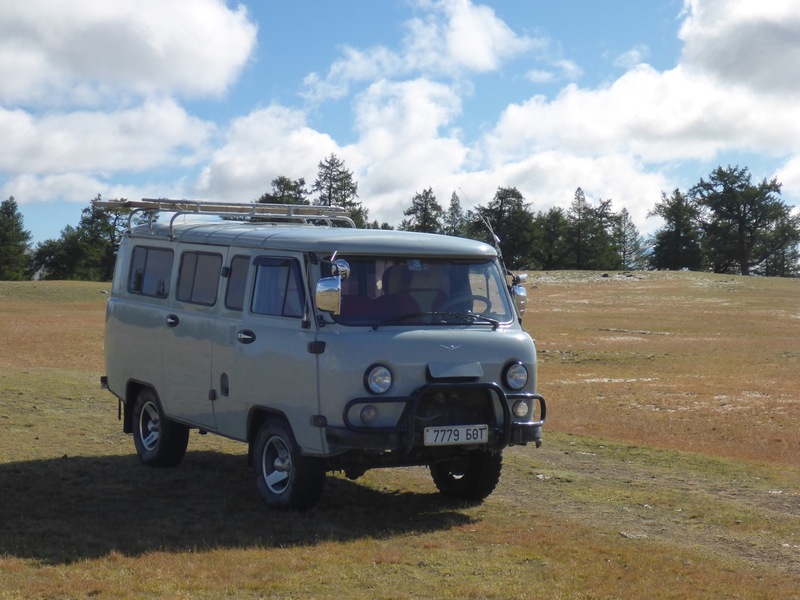 We asked when they were leaving and the answer was right now, so we hopped in an old Russian jeep and were on our way before we knew what happened. A few minutes outside of the city, we were quickly driving through expanses of rolling green hills as far as you could see, no fences, no buildings, nothing. 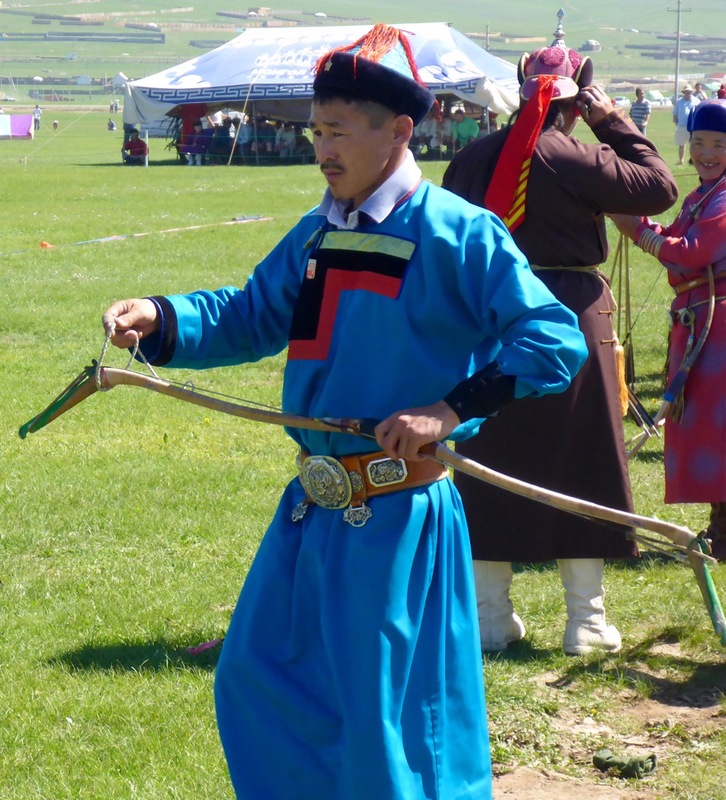 We knew we’re arriving at the festival when we started seeing Gers (traditional nomadic tent-homes, like yurts) and herds of horses. There were thousands of people there. We started our day at the archery competition, one of “The Three Manly Sports”, which is what Nadaam is all about. The traditional dress is amazing and beautiful. And the skill of the archers blew us away! Even more so when we got to try our hand at it ourselves – it was tough! And we were using a little kid bow. 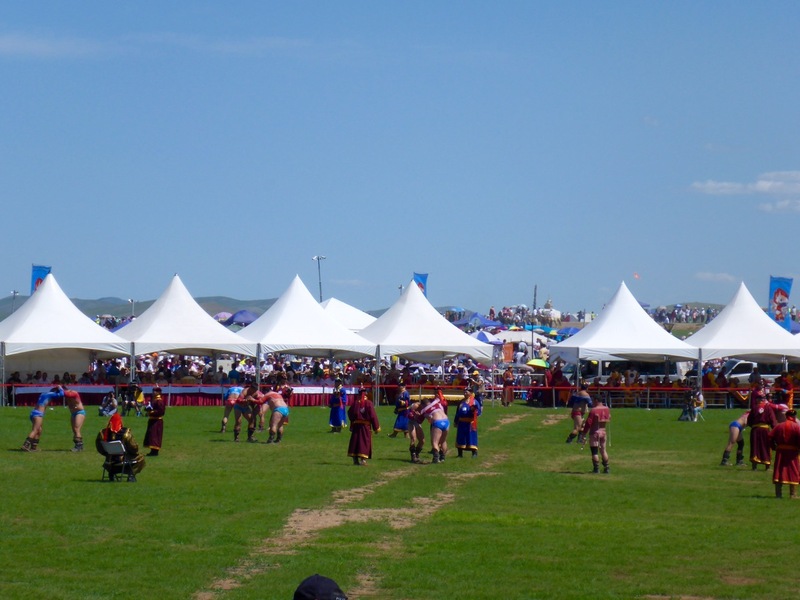 Next up we went to see some traditional Mongolian wrestling. Which involves quite interesting costumes! 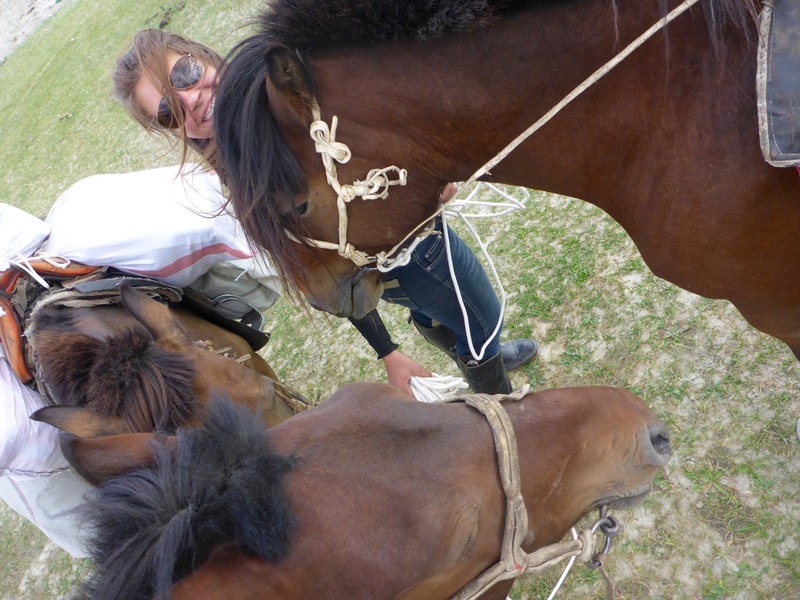 I loved how there were horses everywhere! 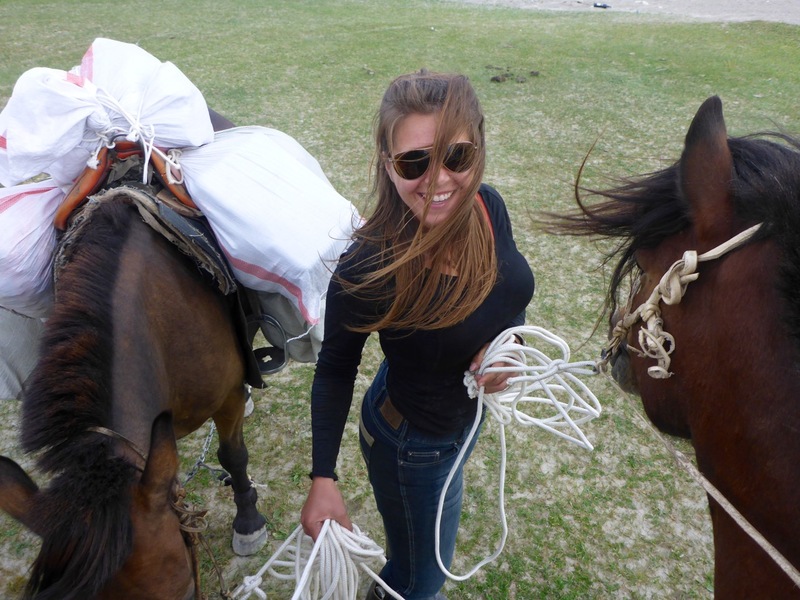 The people are incredibly skilled riders – standing up in the saddle, texting and galloping at the same time. We grabbed a seat in some bleachers next to where the horses were parked. The final event we went to see was horse racing. The races are long distance – 25 kilometers – and are designed as a straightaway with no turns. That’s because the riders are little kids from 4-9 years old, and it’s safer if the kids don’t have to turn the horses. Basically the kid is just there to whip the horse and make it go fast. They use kids because they’re so lightweight, and they use virtually no saddle. 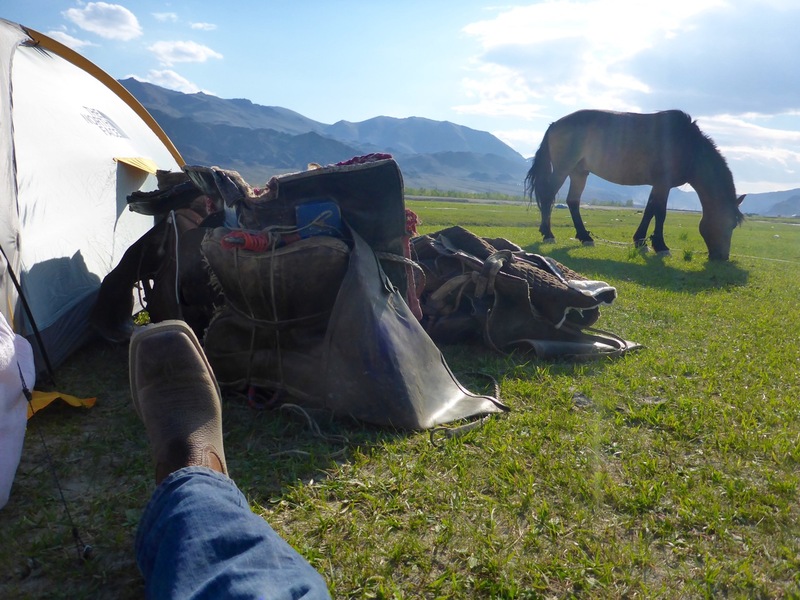 We grabbed a seat in the grass when the horses and riders started heading out, thinking the race would start soon… but two hours later we hadn’t yet seen the telltale cloud of dust. That’s what you look for, a big cloud of dust in the distance. The riders have to trot the horses about 20 kilometers out from where you first see them and then turn around and start racing. We were so excited when we finally saw the cloud of dust, and it was over just minutes later. 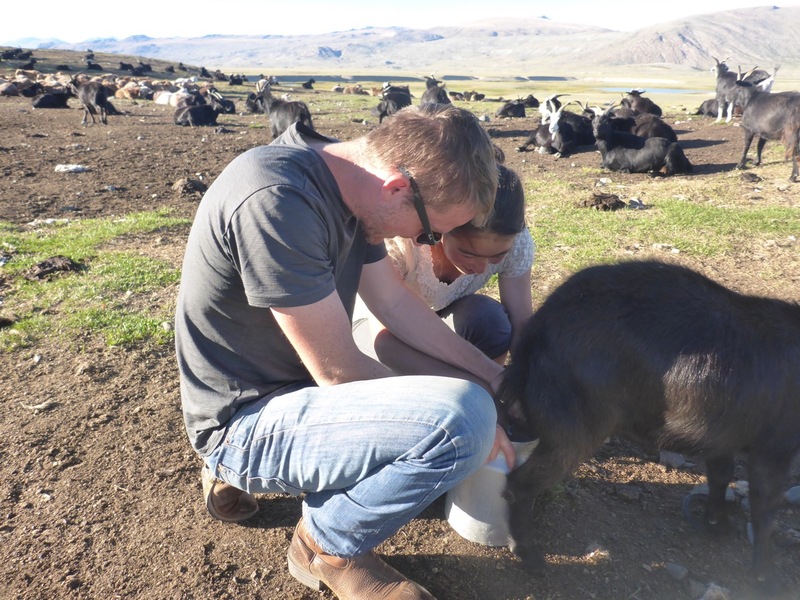 We finished our day off with some fermented yak milk and evading the traffic jam leaving the festival, by heading for the hills. Our driver saw the traffic, busted a u-turn and drove right off the road. We just started flying through the grass, over creeks and rocks, and we made it back to the hostel in no time. 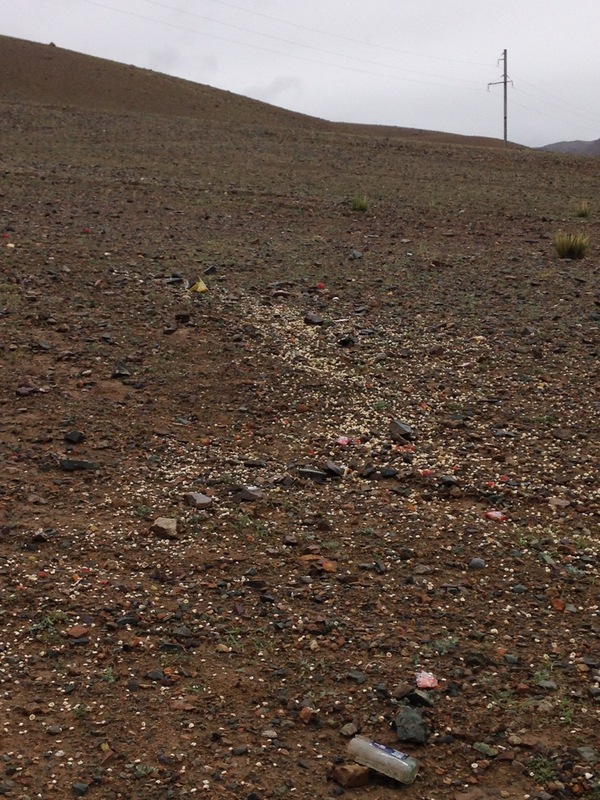 What a first day in Mongolia! Happy Birthday to Rick, Jacobus-Style! We were in China for Rick’s birthday, and had been talking about how we wanted to celebrate for a while. 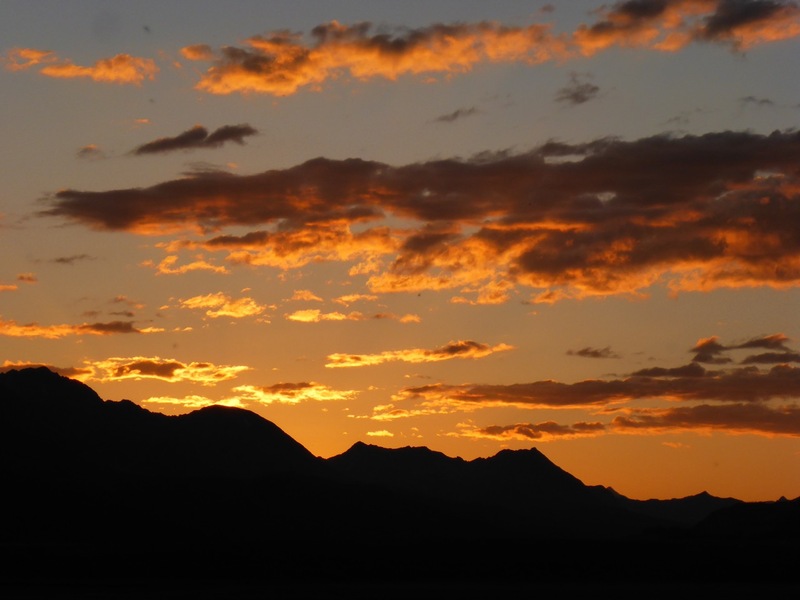 As a going away gift, our friends Will and Angie Jacobus gave us “a night out Jacobus-Style” – for those of you that know them, you know what that means! For those that don’t, let’s just say it’s “go big or go home” style. 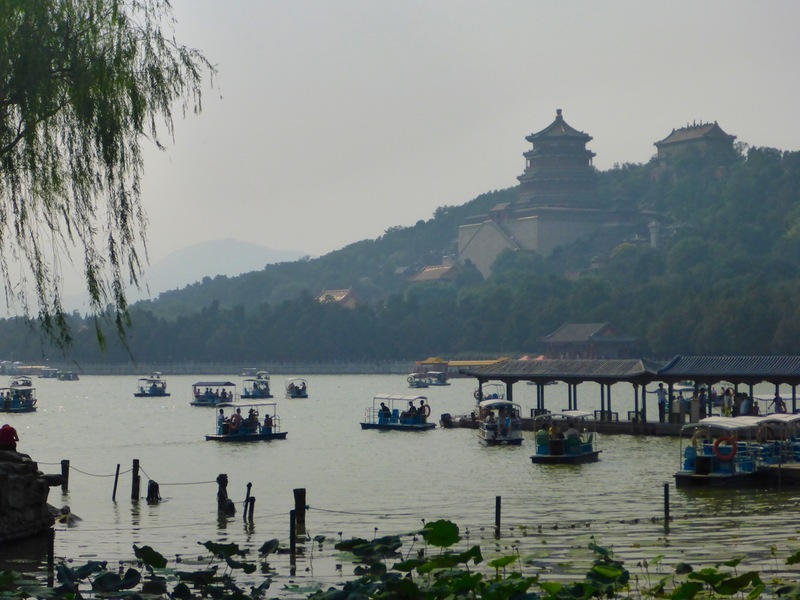 We knew Beijing would be a great place to go Jacobus-Style, and what better occasion than Rick’s birthday. 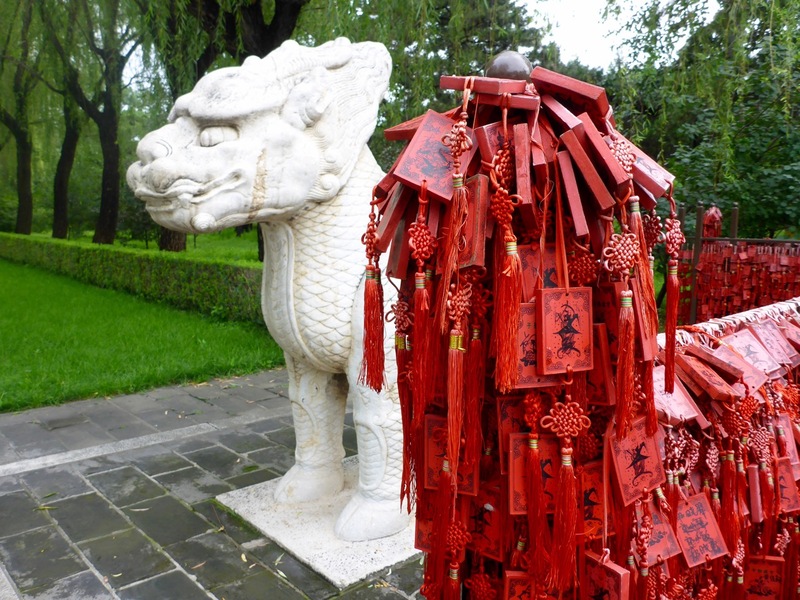 I found the perfect place – a 600 year old Buddhist temple. No seriously. 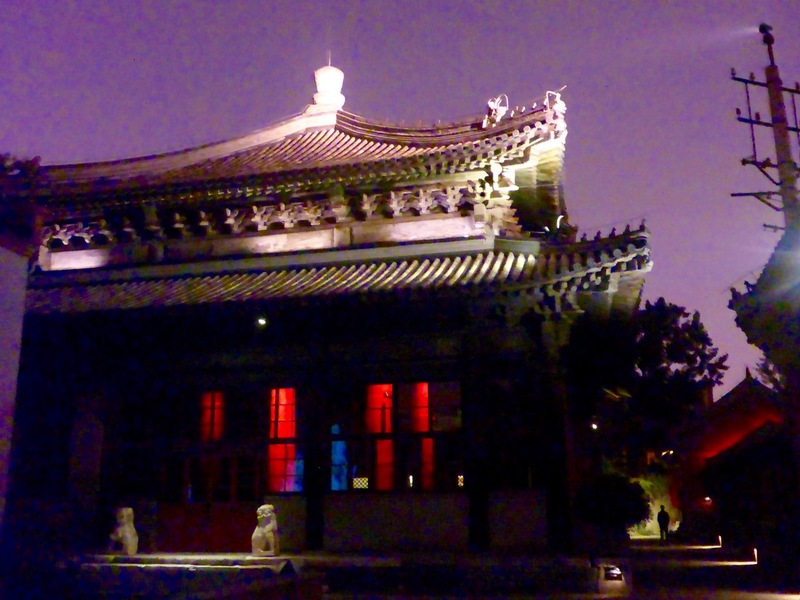 It’s one of the top restaurants in Beijing and it’s in a 600 year old Buddhist temple. It’s also an art gallery. And it’s known for it’s over the top service. I called for a reservation and told them it was Rick’s birthday. When we arrived we were greeted with two glasses of champagne and offered a private viewing of the grounds and gallery. It was beautiful! The pictures don’t begin to capture it. We were seated in the gorgeous interior and ordered the tasting menu. 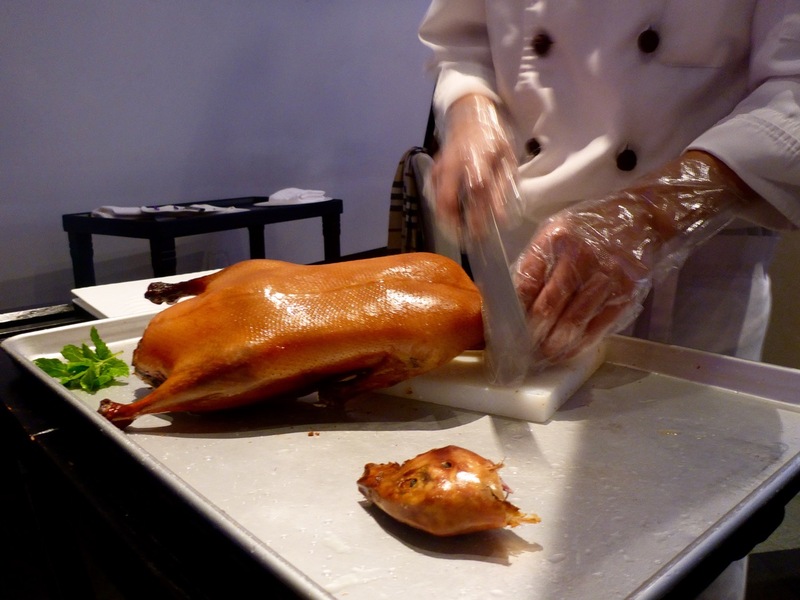 Each course was French twists on traditional Asian cuisine, and all delicious! Rick got four different birthday desserts. And his very own cheese cart. Yep – his own cheese cart! We spent the entire night there, and didn’t even realize it was well into the morning when we were finishing up. It was such a special and incredible evening that we’ll never forget. Thank you Will and Angie for such an amazing experience!! 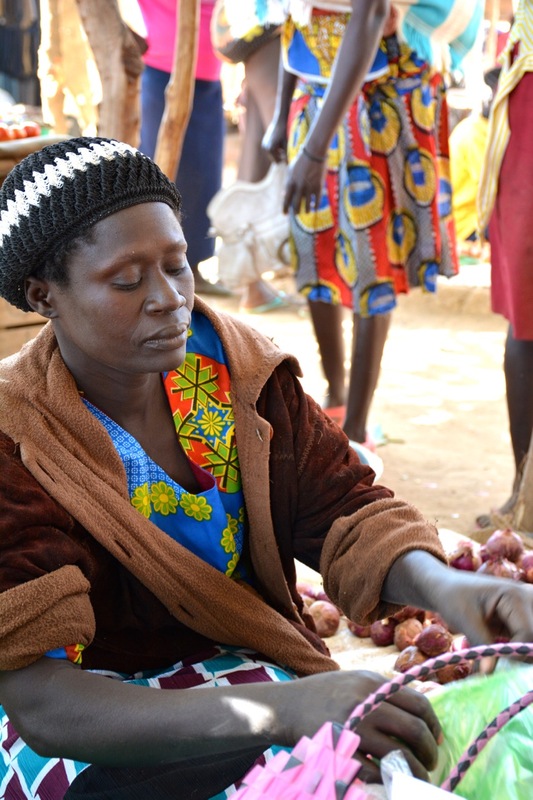 We meet Regina while she was cleaning onions on her mat in Wudo market. 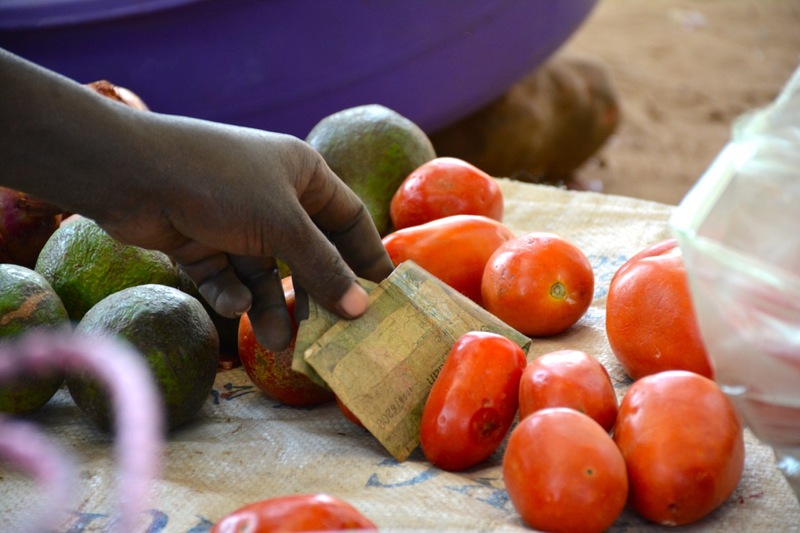 We sat down to talk with her about what God is doing in her life through the micro-finance ministry of Seed Effect in Kajo Keji, South Sudan. It turned out to be a little challenging – because she was so popular! It seemed like everyone in the market wanted to buy from Regina even though there were many other people selling similar vegetables. Regina grew up surrounded by conflict, losing members of her family to the conflict, and with what little they had they were just sustaining themselves with food. She wasn’t able to go to school as a child. Without any education, Regina was forced to work as a very low paid cleaner. 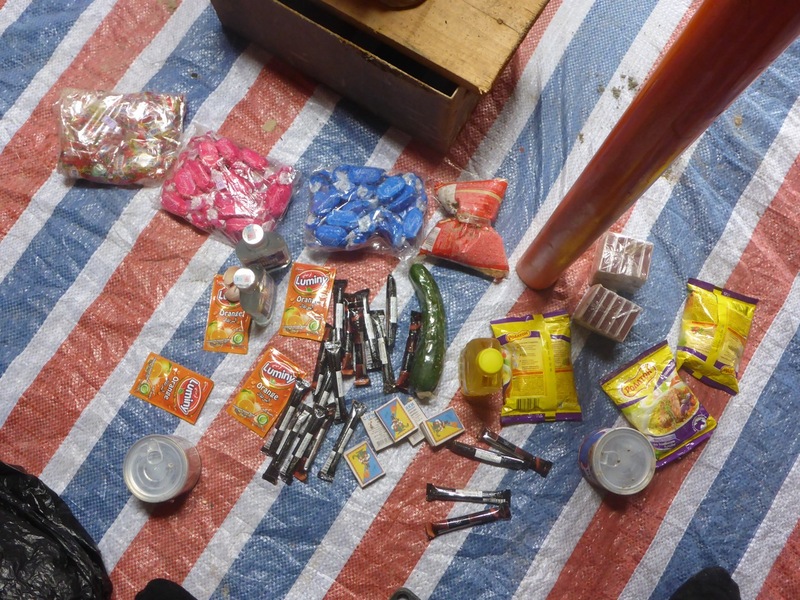 She shared with us how she used to hate knowing that she wouldn’t have any food to take home to her family, and how helpless that made her feel. Not only was she unable to survive on the meager wages, but it was hard manual labor, with unpredictable and excruciatingly long hours. So much so that when she became pregnant with her twins she was forced to leave the job. Regina found herself pregnant, jobless, with children to support, no business experience and no savings to fall back on. She said the word the best described this time for her was “Alone”. She says God provided a way to her soon after that – and that way was a loan and education through Seed Effect. She heard of Seed Effect through people in the market, they told her she could start small, and grow, and have her own business. She wasn’t sure where to start, so she asked for a loan to start a small restaurant. As she grew to know the Lord, she saw how He had showed her love and provided mercy to her and provision that she couldn’t do on her own. Since she can’t read, the scripture shared by Seed Effect was her way to get to know the Lord. She also grew in her business knowledge through Seed Effect’s business seminars. With new found confidence, she took on a fabric business, and then transitioned to her current business selling produce and food items. Regina says one of her favorite business skills she has acquired from the seminars is time management. 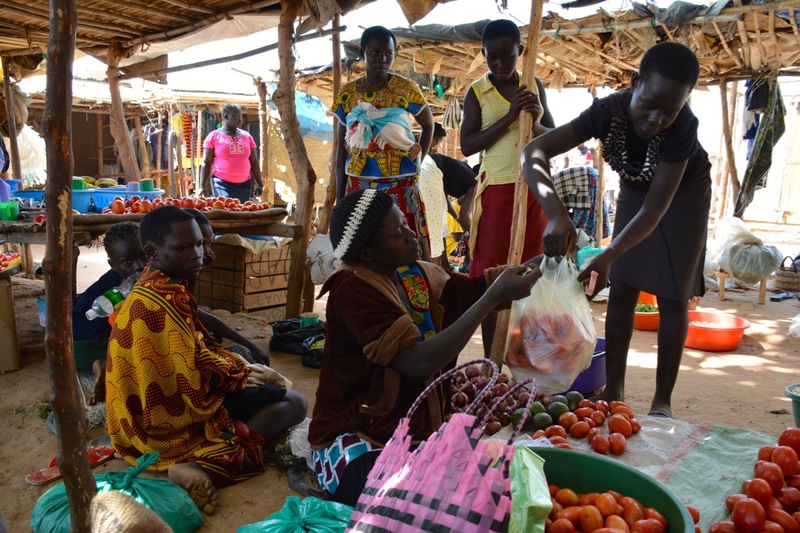 Specifically she learned that if she gets to the market early, and has her goods all set up and displayed, ready for customers as soon as the first one arrives, she gets more business. We got to encourage Regina with how we saw her living out Ephesians 5:15 “Look carefully then how you walk, not as the unwise, but as wise, making the best use of the time” and being faithful with her business. Regina wouldn’t let us leave without telling us one last time how thankful she is that through her business she is able to come home with something to put on the table for her family, and to pay for her children to attend school – all 7 of them!